This week I wrote a lot about air travel. 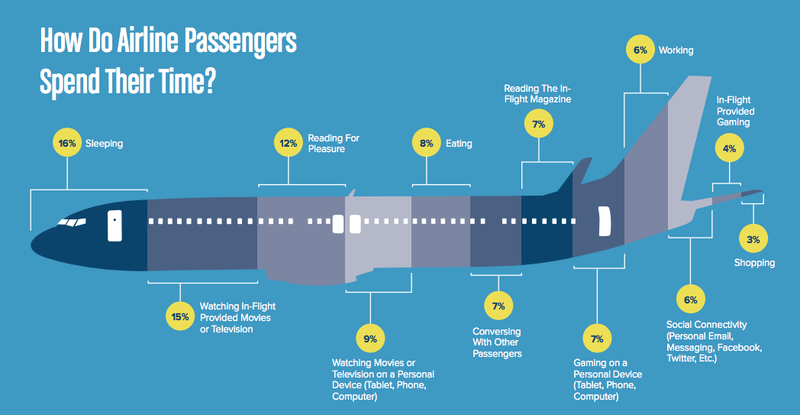 Let’s conclude this study with an interesting statistics on how people spend time while on the plane. So, 3% of time spent on shopping doesn’t look too impressive at first. This blog from Boeing suggests that the average flight length today is 6 hours [link]. This leaves the passengers about 11 mins for shopping on average. Doesn’t look like a lot (when compared to 6 hours). But, apparently, people shop much faster when on a plane: “duty-free on airlines is a US$3 billion business worldwide, and still growing” [link]. This entry was posted in Amazing technology, data, and people, Analytics, data analytics, big data, big data analytics, data on the internet, data analytics meaning, Data Analysis and Visualization, Past, present, and future and tagged Analytics, big data, big data analytics, Data Analysis and Visualization, Data analytics, data analytics meaning, data on the internet. Bookmark the permalink.